One night about 35 years ago I was leaving my office in Arlington, Virginia. As I approached my car in the parking lot it was getting dark and no one else was around. Then I realized I’d locked my keys in the car that morning. I searched the entire parking lot, hoping to find something I could use to pry open the car door lock. After much searching I came up with nothing. I was standing there quietly at my car, wondering what to do. I looked down and saw a coat hanger—I was standing on it! It definitely had not been there a few minutes earlier. I picked it up, formed a hook with it, and used it to pry open the car door lock—it took about 2 minutes. 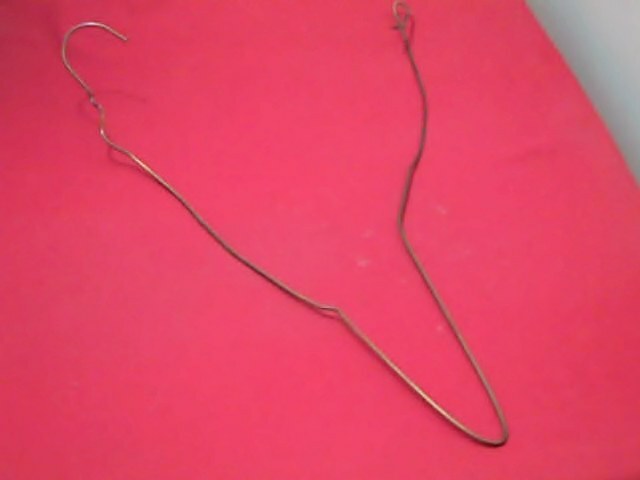 I called it the miracle coat hanger. I’ve kept it all these years—you see it in that image above. So what happened that night long ago? When something wonderful and wanted unexpectedly happens, as with John in his story, you often call it a miracle. Yet miracles are the most ordinary and natural of events. You do not usually see them as ordinary or natural because you do not know who you really are. You are physical extensions of that universal, or divine, energy you call by many names—God, Goddess, the universe, all that is, and so on. Yet you generally see yourselves as separate from, and often unworthy of, that energy—by whatever name you call it. Yet you are powerful beyond your wildest imaginings. If there is one thing we’d love to see you practice more, it’s remembering you are divine energy. Period. It’s that simple. As you gaze into your own eyes feel the energy flowing through your body and your entire being. Know you have all the ability and power to manifest, to create, whatever you want. The more intense your wanting, the closer your manifestation is to your physical reality. Manifesting is really that simple, no matter what you want to manifest—relationships, health, money, peace, love—or a coat hanger. Here are Esther Hicks and Abraham giving a very short definition of miracles. And here they are with a longer definition. Only the first 5 minutes of this video is on miracles. How Are Healing Miracles Possible? What miracles have you experienced in your life? Why do you think they happened? Please share your thoughts and comments with us below. Your story about locking your keys in the car reminded me of the time I lost my keys. I was out walkin with a friend and her young children We walked along the river bank which was surrounded by high summer meadows. I had given the children piggy back rides and we had run through the tall grasses and must have covered quite an extensive area. It was only when I got home I realised, with all the running, my keys had fallen out of my pocket. Although I returned to folliw the river path we had taken, there was no sight of my keys. However, I had been learning that nothing could truly be lost because of all-seeing oneness of Mind so, although I had to give up looking for them that night, I never excluded the possibility that I might find them. I managed to get replacement keys easy enough and thought no more about it until a few weeks later whilst walking with my mum in the same meadows I found myself stopping at a certain point…’I’m just going to have a look over here’ and walked into a thick patch of undergrowth and stopped….guess where…..there were the keys right before my feet!!! I had been guided right to them!! It was a marvellous and thrilling experience. Thank you so much for bringing that wonder back to mind. Thanks very much, Margaret. What a beautiful story! I used to see physical manifestations as ‘miracles’ but now I see that as ‘magic’. As we create this illusion we can certainly manifest things and events and it can be fund to do. 🙂 I now feel the need to go beyond that, to see the illusion for what it is and find my home, to end the illusion. To me that is what a miracle is for, to help me find my way home. by Kenneth Wapnick when I forget what a miracle is for. i feel there are miracles that keep happening on a day to day basis.. they are not huge ones but nonetheless they keep happening. Like yday i bought a tennis bag and lo and behold next day i see my most favorite player with same bag and i realize thats what i wanted to do – buy the bag that he was using but when i went to store i did not remember and just bought the one i liked. but amazingly it was same one that i would have been most happy about. At work i got a task that i had no clue about and i felt stressed out last night. Then today suddenly out of the blue that became a non issue and i also got more time to learn about it which i wanted to but in a nice pace instead of stressing out. Soemtimes many small things happen over period of time to make it look like a giant one. i have been working on a hobby of mine and put in lot of hours. Suddenly one day a friend who was way way way better than me saw me and she said oh my god now you are way better than me. I never thought i would ever be better than her. Then last year i wanted a 2nd job to expand myself etc i got a job thats even beyond what i asked for. I work from home on the 2nd one, i can watch tv my favorite sports, now watching world cup soccer while i work. Its mind blowing sometimes. But i trust that how the Sun sends the rays to the plants from million miles and how the plant naturally grows to where it needs to, we are the same. if we let Universe take its course on us while we pursue from our hearts then everything seems wonderful. Thx John for opportunity that i am able to see how lucky i am! Thanks very much, Rafa, for sharing your experiences. Miracles are all around us, and all we have to do is open our eyes to see them. I wasn’t able to view the second video but loved the first definition. After this last week I firmly believe in miracles! I, a while back, was doing a little exercise to find the perfect house for Milo and I. I needed something smaller with Eco friendly electric air source pump driven heating and lovely lawned gardens for Milo to play in. Anyway, time passed and passed. Then suddenly I noticed a house exactly fitting what I had been visualising. Two days later and I have the keys and planning my moving in. A miracle? I like to think so! Sorry you couldn’t see the second video — maybe it’s an issue with US/UK video compatibility.